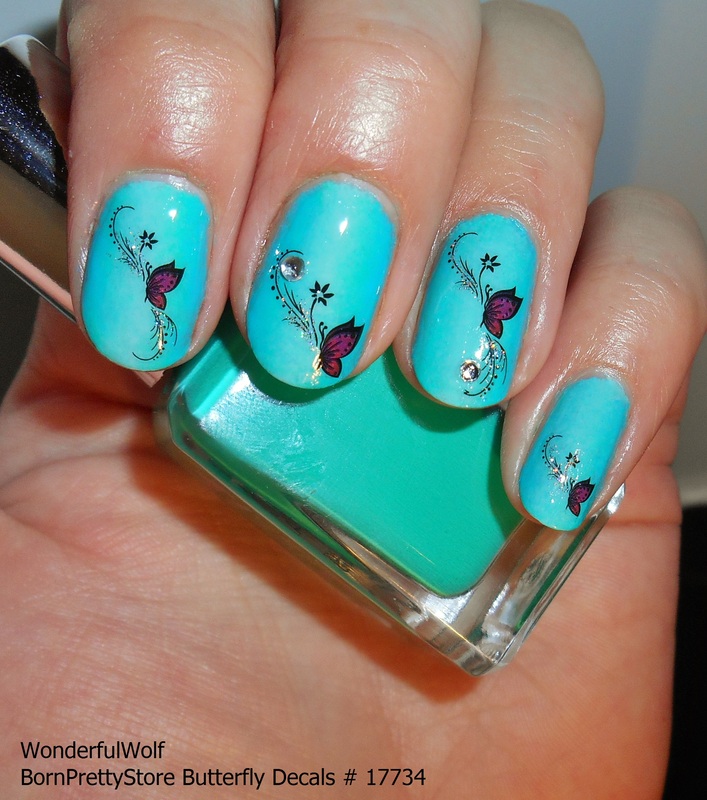 So this is actually from the ‘nail fail folder’. Firstly because it’s just not a good photograph as it’s out of focus, and secondly I’m sporting nubs on three out of four nails – only one more than usual to be honest but it looks so much worse. Another thing that bugged me was the fact the gold elements are of different tones. 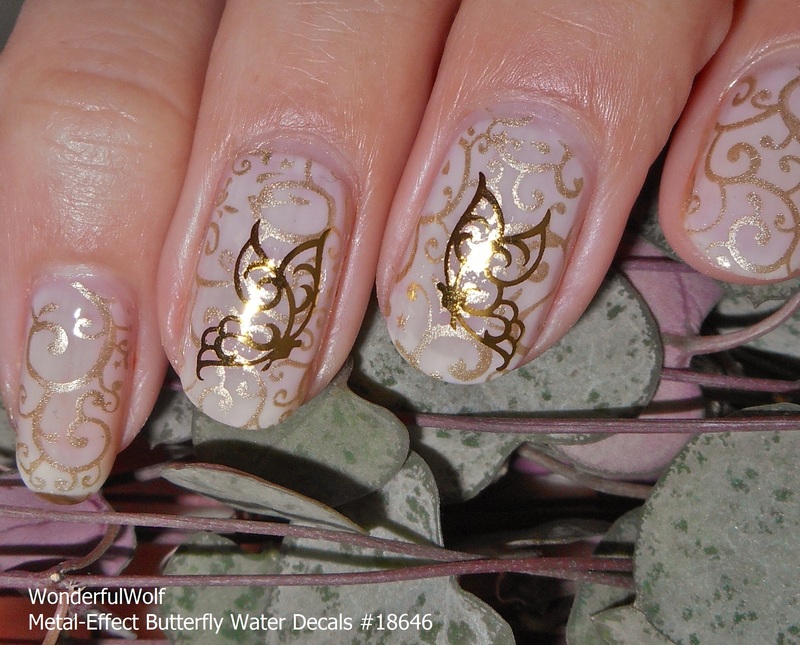 The lovely metallic butterfly is actually a ‘water decal‘* from BornPrettyStore, I’ve used them before for this design here where you can read my whole review, and the foil is from Wilkos. 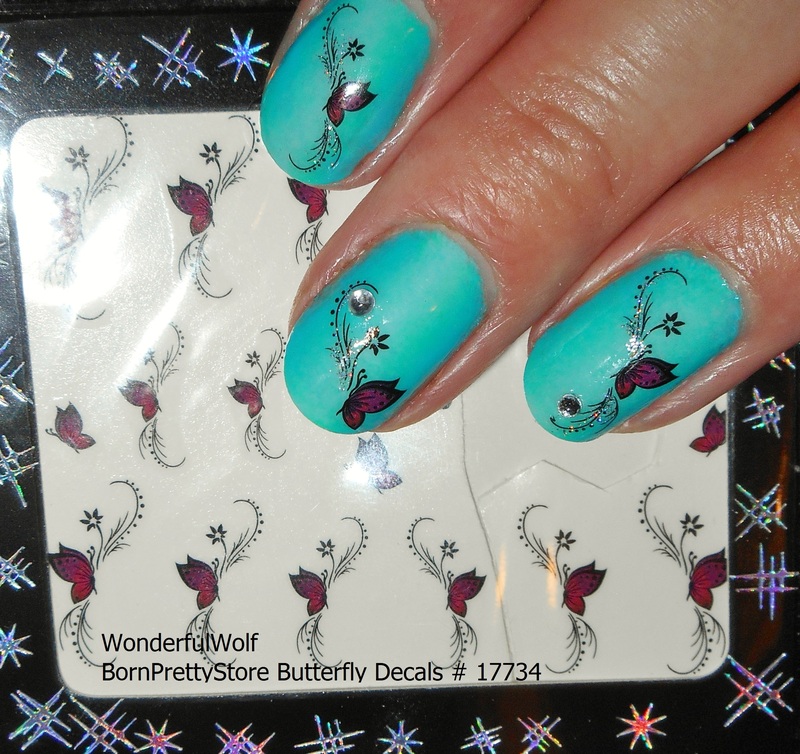 So I was sent these super pretty ‘Metal Effect Butterfly Water Decals‘* from BornPrettyStore to try out. For a while they became an item I’d sit and look at and I’d want to use, but then wouldn’t because I was scared I’d mess up something so pretty. Today I decided to grab the butterfly by the antennae, and go for it. Fortunately because BornPrettyStore decals are a dream to use, they came out really nice! The below photo was taken with a flash, and as you can see they truly are ‘metal effect’ – look at that shine! I started off, as usual, by selecting what decal I wanted to use. 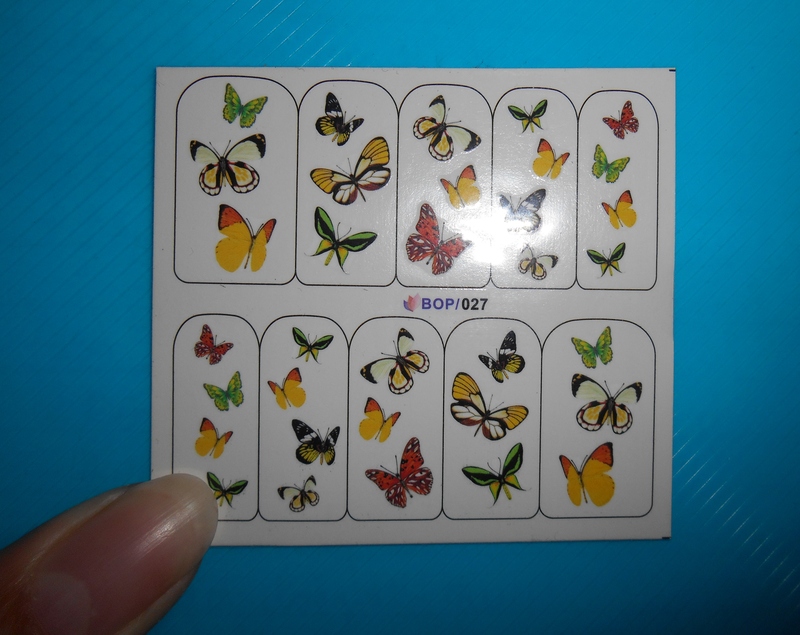 This product contains 6 butterflies and as they are all the same size and quite large, I decided they were suitable for my ring and middle finger. The next step was preparing my nail, I painted, stamped and top coated but with the decals being so decorative they would look stunning on a plain base colour. I then cut out my selected butterfly and gave it a 10 secondish bath in my little pot of water which I also use for water marbling. It’s hard to estimate how long they were really soaking for because 1) I never actually count how long they’ve been in and 2) I tend to take them out once the decal starts to slide off the backing anyway. 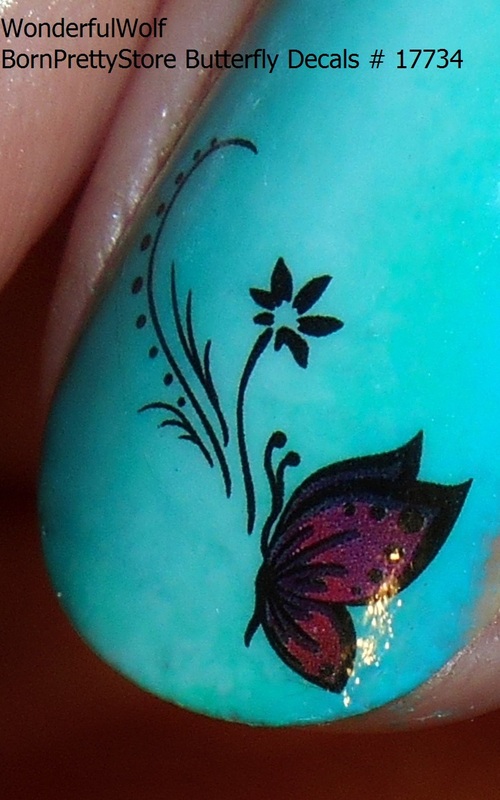 Different people use different techniques to get the decal from the backing paper on to their nails. I tend not to remove it completely from the backing paper as I’m scared of them curling and sticking to itself. Therefore I take the backing paper and decal with my tweezers from the water to my nail, then use my finger to slide the decal in to place. Once I’m happy with it, I give it a slight dab with a tissue/kitchen roll/cotton pad whatever I’ve got to soak up any excess water. I’ve never had any issues with a BornPrettyStore decal not sticking! I then top coated my decal, which I was seriously nervous about. In the past, I had some bad experience with top-coating ‘metal effect’ items (tattoos and foils mainly), it either made their colours run or completely disappear! I’m glad to say though, this was not the case with these decals – LOOK HOW SHINY THEY STILL ARE! Of course that photo is with flash, so for shinyness comparison here’s one taken in natural daylight (Yup, there was actual daylight today unlike Wednesday when it was so dark I had to put lights on at like 1pm!). Aren’t they just gorgeous! I’m so glad I finally had the guts to use them. – They are truly ‘metallic effect’ – such luster. – They came off the backing paper without hassle. – They were sticky enough to stick to my nails. – The metallic effect didn’t freak out on being top coated. – Did I mention that they’re beautiful and shiny? Now that I’ve talked you in to buying these, head on over to BornPrettyStore where you’re more than likely to find other things to add to your basket. If any items happen to be full price, enter the code ‘AZYW10’ at the check-out to receive 10% off. P.S and remember free postage! So it’s actually been pretty nice for the last few days, therefore I wanted to wear something summery. 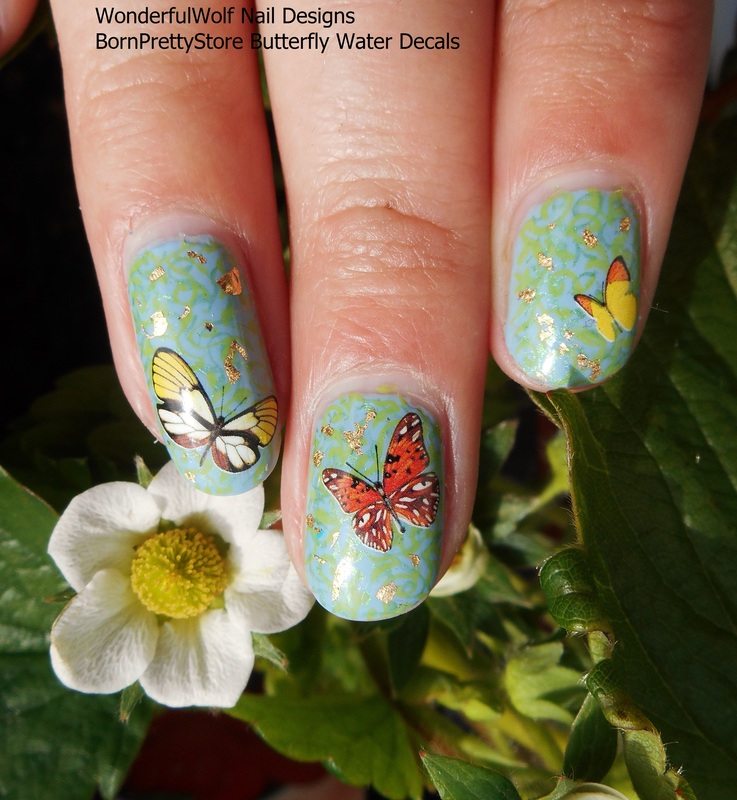 I was sent these Butterfly Water Decals* from BornPrettyStore to try out and thought they’d be perfect to the summer weather. As per usual the water decals were of good quality which is amazing seeing as right now, 19/08, they are $0.99. 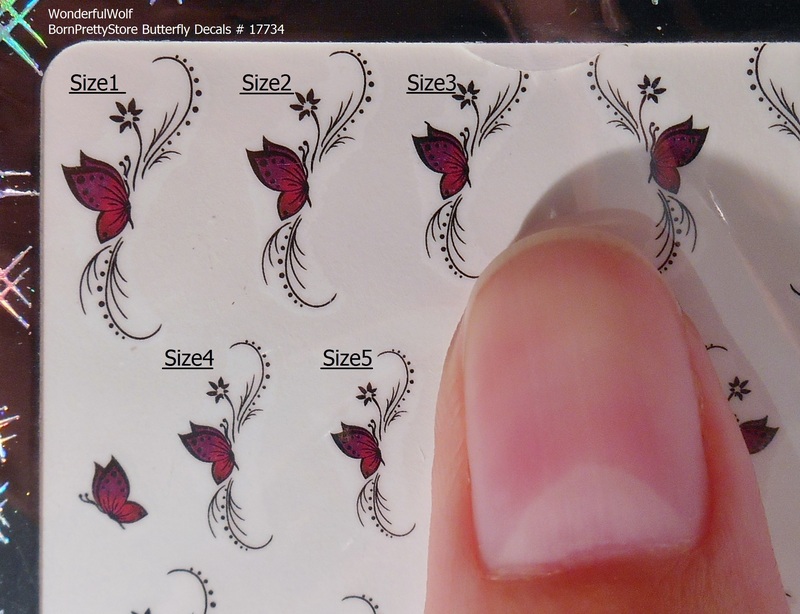 The sheet of decals included 5 different sizes of butterflies – super handy as, I don’t mean to state the obvious here, but everyone’s nails are different sizes. Before applying them to my nails I decided which ones would be the most suitable, and trimmed them if necessary. I cut them before putting them in the water to make it easier for myself, as shown below. The water decals from BornPrettyStore always really impress me; they only take around 10-15 seconds in the water before they can slide off, they don’t feel too delicate (anyone who uses water decals knows the fear of ‘oh god, what if I tear it’) and once on your nail they allow for some re-positioning if you don’t get it right first time – unlike some others that are just too sticky. 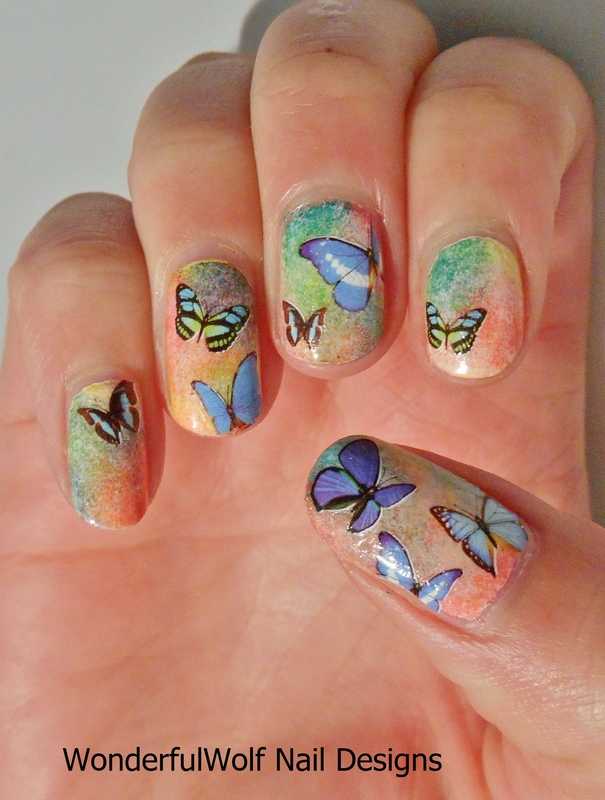 If you fancy getting your hands of these Butterfly Water Decals, head on over to BornPrettyStore now! If you order anything remember to use my code ‘AZYW10’ to get 10% off full priced items – and remember it’s free shipping! 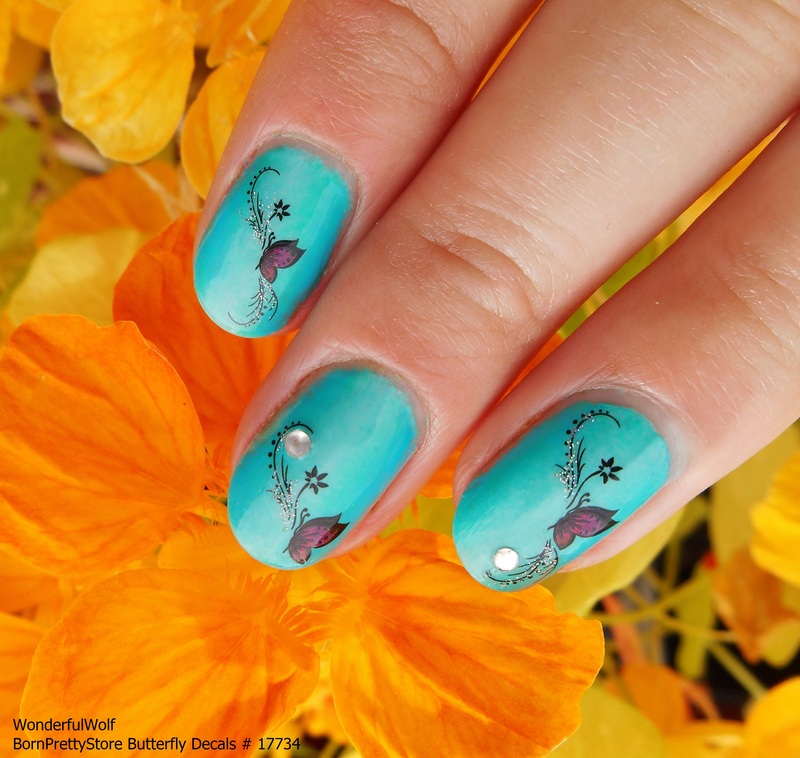 So these are some more BornPrettyStore water decals, I love using them because they’re so easy to use and give such a fantastic result. I’ve used the blue butterflies like twice – here and here, so decided to buy another colour. 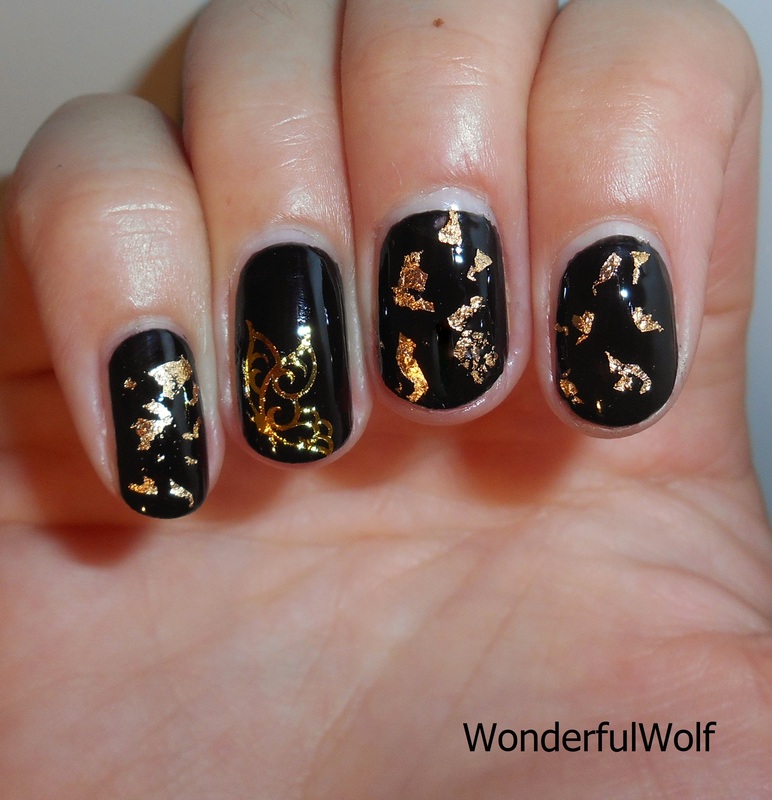 I think they’re quite autumnal colours which maybe aren’t so suitable for this time of year but… I put them on top of some subtle, almost non-existent, leafy stamping and then added some gold flakes for some bling bling! If you haven’t yet checked out BornPrettyStore I really urge you to do so, at first I was like ‘Oh no, a cheap Chinese supplier which will no doubt supply bad items and postage charges’ but I could not have been more wrong. Yes their items are cheap, but the quality is amazing – so much so I have stopped buying my nail art supplies from eBay. Shipping is free regardless of how much you order! As I’m in Scotland postage can be slow but my orders have always arrived within three weeks. They sell a huge range of items, jewellery, nail art, beauty, home items, etc – I’m a stationary fiend and always manage to pick up more than a few cute items. Just go check them out already! AND incase you think I’m getting paid by them or I’ve sold my soul to them to say these things, I honestly haven’t. Every now and then they’ll send me free items to review which I mark with a ‘ * ‘, everything else I’ve bought myself. Incase you think this compromises my integrity – I’m not scared to say when something hasn’t worked for me, for example the whole sheet water decal I used for my Jellyfish nails so there! 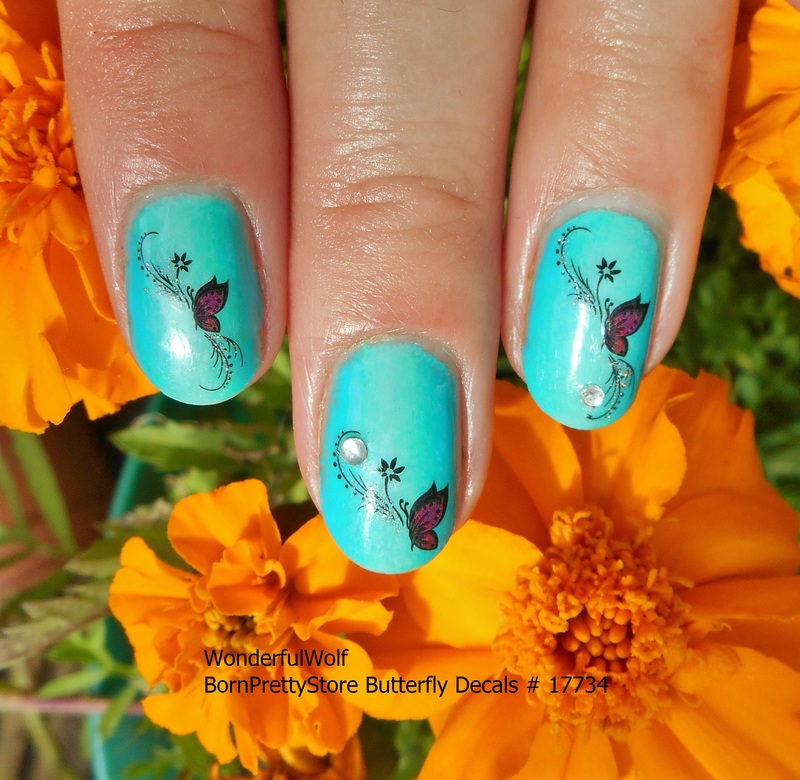 So I couldn’t resist returning to the butterfly water decals* from Born Pretty Store. I felt the first time I used them I just didn’t do them justice, my back ground was wrong and they just didn’t pop! I went for a more colourful sponged background where I just mooshed some colours together, it turned out well. 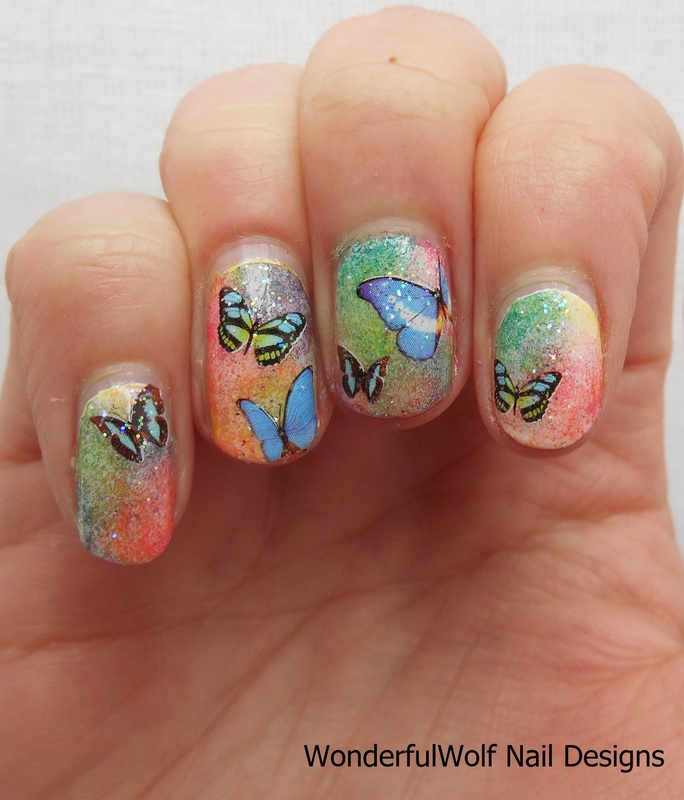 I can’t get over how pretty the actual butterflies are though! The small green and blue ones are definitely my favourite. I then applied a light glitter top coat because it just looked as if it needed to sparkle. I certainly prefer this version. 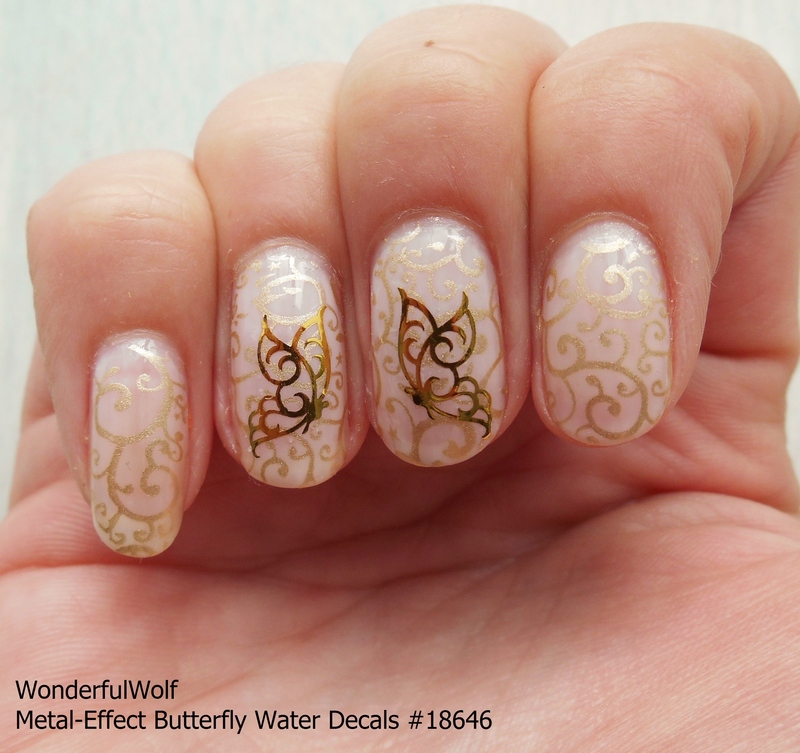 So I was interested in trying out these water decals from Born Pretty Store just because they were so dang cheap! 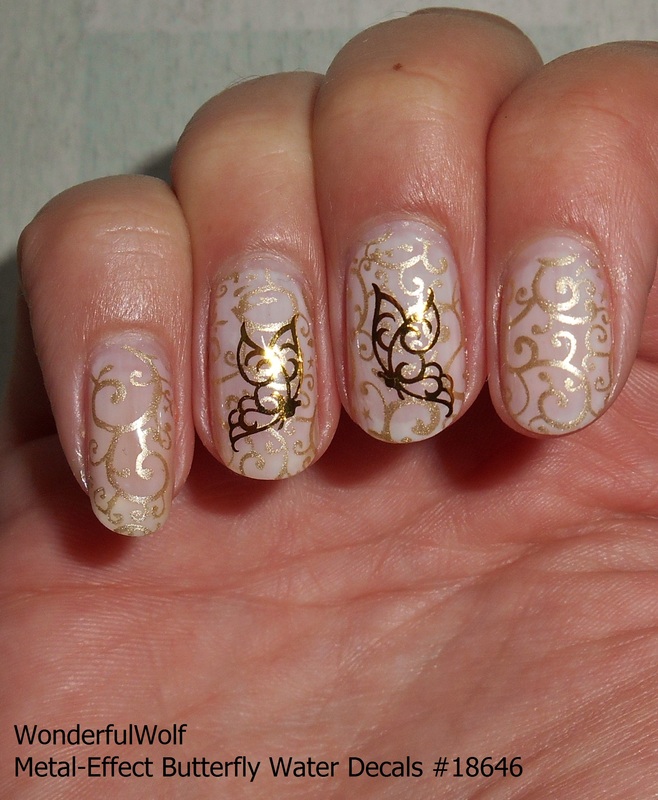 When I had a look at the decals* in the packet, I was at first a little worried about how they would look on my nails as they appeared to have a very noticeable ‘outline’ (you can sort of see it where my flash has reflected off of them). I worried in case it was going to make them look really stuck on, and possibly even curl with a top coat. However, they applied like a dream – no visible outline nor top-coat curling! Hooray! As for the application – they are free of mess and so easy to apply! All you need are the decals, a tub of warmish water, tweezers, scissors and a tissue. 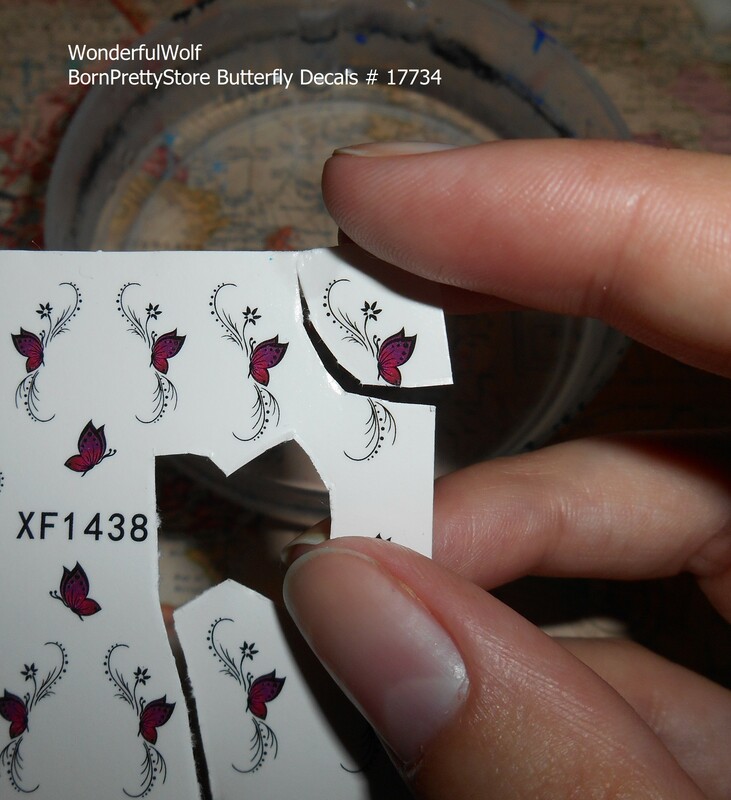 -You cut round the desired butterfly and peel off the transparent protective layer. – Dunk the butterfly right under the water, and let it drown there. 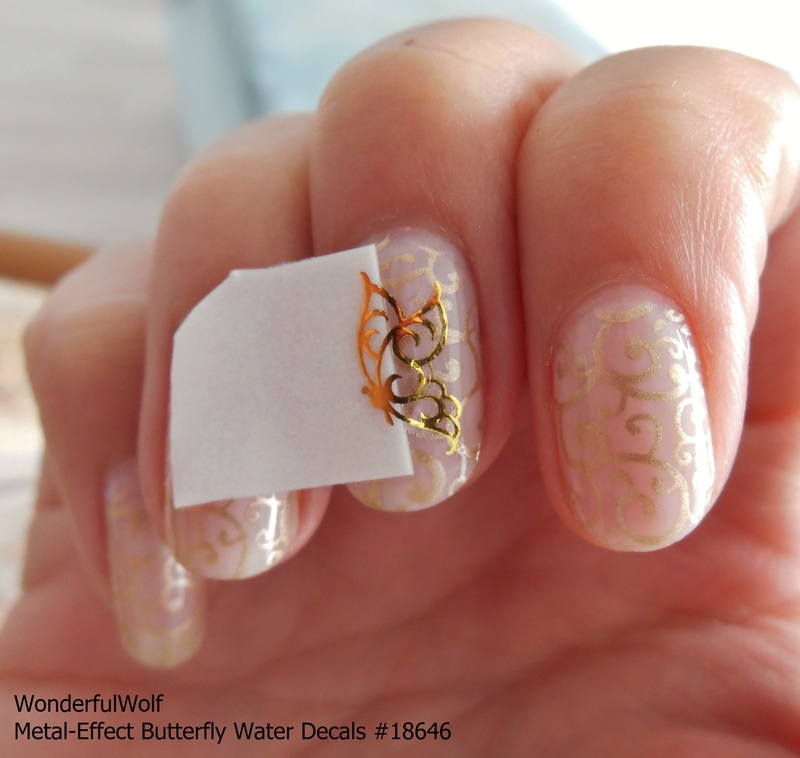 – I then placed the decal onto my nails, you can move them around a bit before they ‘set’ due to a little bit of water still being on them. 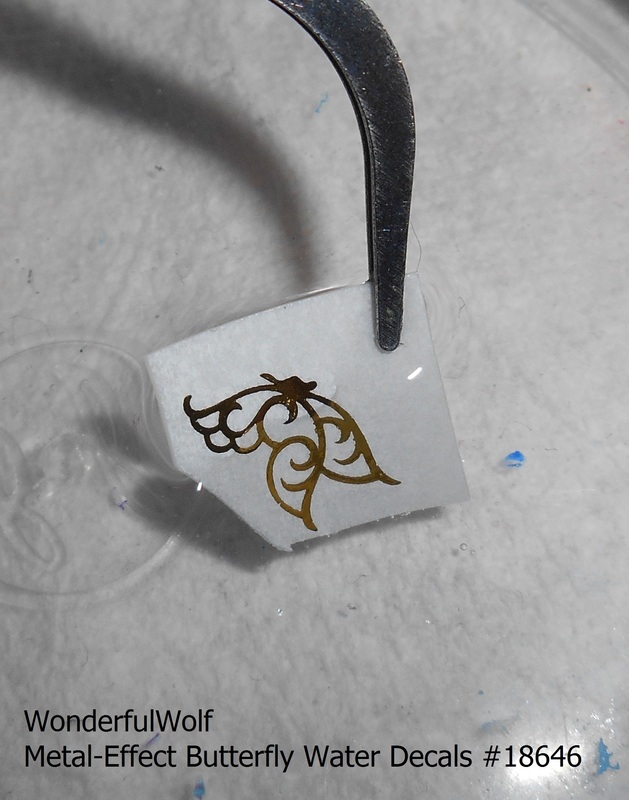 – Then once in the desired position, with the tissue I lightly pressed down the decal and dabbed up the excess water therefore ‘sticking’ the decal to my nail. The instructions on the back of the packet talk about ‘blow drying’ and actually feature an illustration of someone holding a hairdryer to their nails, my nails never went anywhere near one and they still turned out great so…. 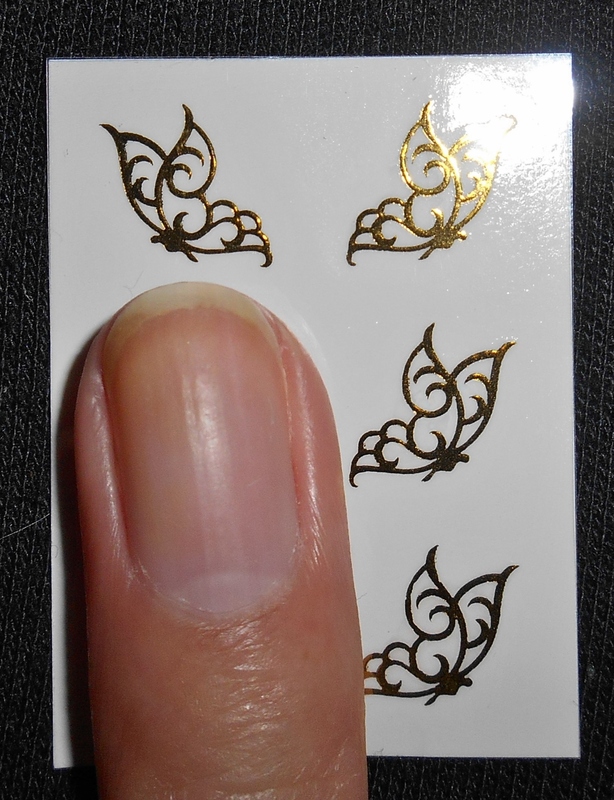 The decals themselves are also a really nice size, I managed to get two onto my smallest nails and they do come in several sizes which is even better! And there’s still plenty left for another design. Remember to use the code ‘AZYW10’ for 10% off your Born Pretty Store order. The Water Decal having a bath. 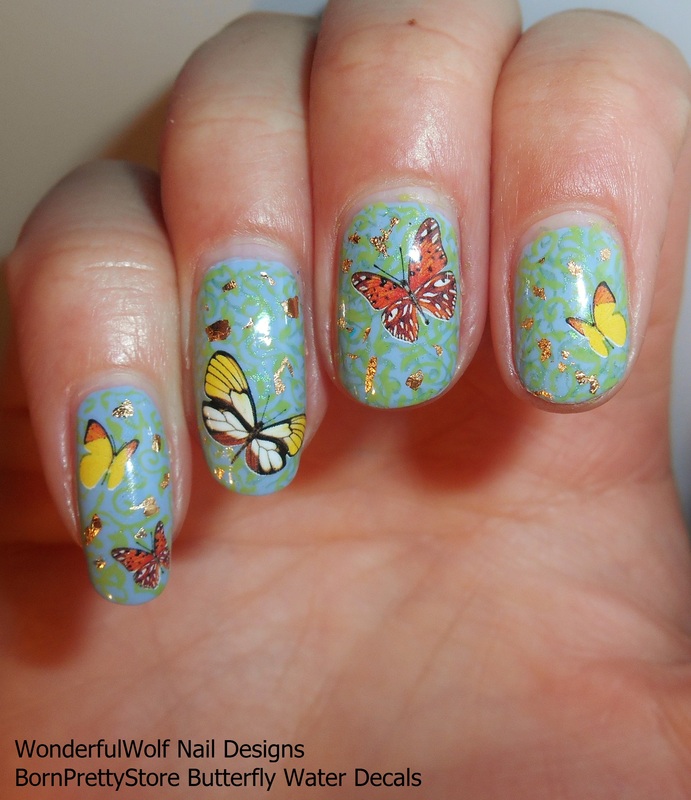 This is my favourite, as it has so many butterflies on it! *The decals were provided to me free of charge in return for a review on my blog.